Snowmobiling is pretty much about the buddies you go with. Make sure you bring along at least one newbie because you’ll enjoy the entertainment. A ride isn’t a success unless at least one person gets stuck or lost - it’s all part of the fun! Along with the newbie, make sure you have the guy whose sled is always in a million parts on the floor of his pole barn. He’s the “wrenchhead” and will get you out of any breakdowns on the trail. Last, bring the old timer. He’ll be able to read the maps and temper the pace just enough to keep the youngin’s in line. Now let’s get the party started. Typical rental rates are about $195 for four hours on a weekend. Or check out guided trips. For true entertainment, though, might we suggest a two-up rental. You can take turns driving and it’s much easier than the dreaded tandem bikes of summer. Wherever you go on your sleds, make sure you pick a spot to refuel. You can’t exactly show up at a white-linen restaurant dressed head to toe in polyester. So be sure to look for the bar/restaurants with other snowmobiles piled in their lots instead. The best places will have the classic metal chairs with vinyl seats and, most importantly, plenty of room for helmets on the tables or along the wall. There’s nothing like a slew of helmets, gigantic jackets and facemasks along a wall to warm the heart of snowmobilers (and restaurant owners) in Northern Michigan. 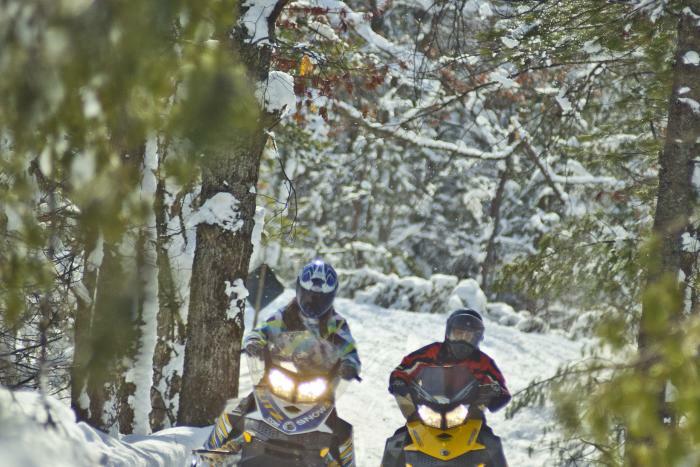 Ranch Rudolph in Traverse City is a mecca for snowmobilers. There are 200 miles of groomed trails that can be accessed by Ranch Rudolph. (If you aren’t staying at the Ranch, you’ll have to park at the staging area on Supply Rd. at the intersection of Dead Horse Rd.) This is a great starting point as well as a place for lodging and meals. The restaurant brings an “Out West” feel while you’re “Up North”! Peegeo’s Food and Spirits was founded in 1983 by a guy who quit a real job and had no clue how to make a pizza. Well, he got it figured out because Peegeo’s parking lot is full of snowmobiles every weekend of the winter. The Empire Village Inn was built in 1958. This establishment has a great history, even claiming a few ghosts in its past! You’ll get the true vibe of Northern Michigan with their old wooden bar and paneling. Pegtown Station in Maple City offers homemade pizza, subs and salads. Maple City was settled in 1866 by J.T. Sturvtevant and his son, who built a factory that made wooden shoe pegs. It was originally called Peg Town, but changed to Maple City when its post office was established. The peg factory operated until 1880 when it burned. But we promise, the food won’t taste wooden! Sure, you’re cruising along at a nice speed but things can get lonely inside your helmet all by yourself. Your thumb will go numb from vibration and the burger from lunch will make you a little sleepy. Time to stop and shake out the old legs. Trailheads are a great spot to pull over and read the map, or pretend to read the map, and get your bearings. This is where you’ll also see other groups and get to make friends. A tip for the newbie: Don’t park behind the wrenchhead because when it’s time to leave, he’ll goose it and shower your sled in a rooster tail of snow. Side note: The DNR usually hang out at the trailheads too, so make sure your affairs are in order. All sleds need a trail permit, which can be purchased online or at most any gas station. Now go enjoy the hundreds of miles of trails and bring home the good stories, especially the one where the newbie got lost and the wrench-head had to save the day.